First enable push notifications in your Xcode project. The library provides support for iOS 10 notification attachments, such as images, animated gifs, and video. In order to take advantage of this functionality, you will need to create a notification service extension alongside your main application. 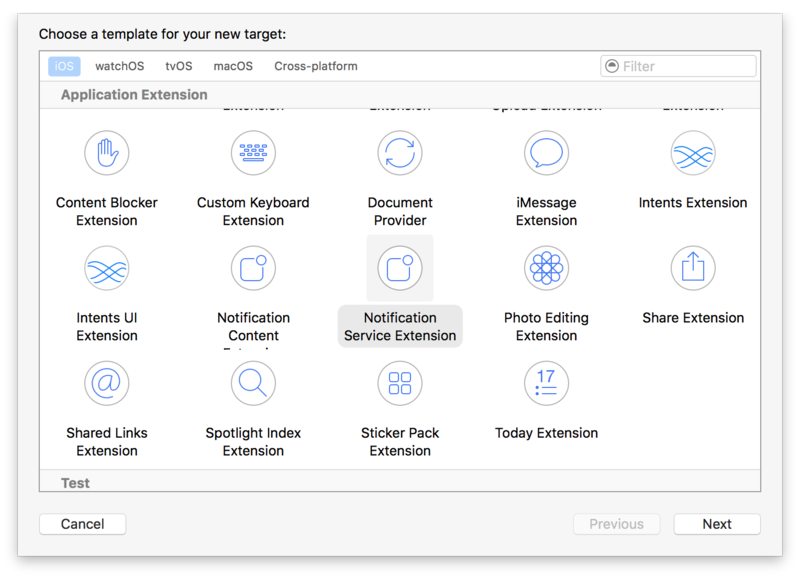 Create a new iOS target in Xcode (File -> New -> Target) and select the Notification Service Extension type. ​In Member Center, the Push Notifications service will appear as Configurable (not Enabled) until you create a client SSL certificate. 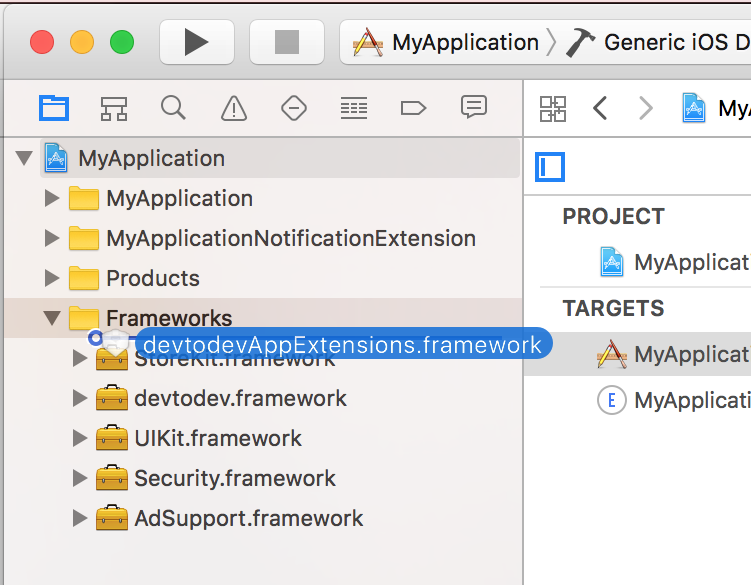 Drag the devtodevAppExtensions.framework into your app project. Delete all dummy source code for your new extension. Inherit from DTDMediaAttachmentExtension in NotificationService. // NOTE: Keep this empty implementation to prevent class stripping. You use Member Center to generate a push notification client SSL certificate that allows your notification server to connect to the APNs. Each App ID is required to have its own client SSL certificate. The client SSL certificate Member Center generates is a universal certificate that allows your app to connect to both the development and production environments. 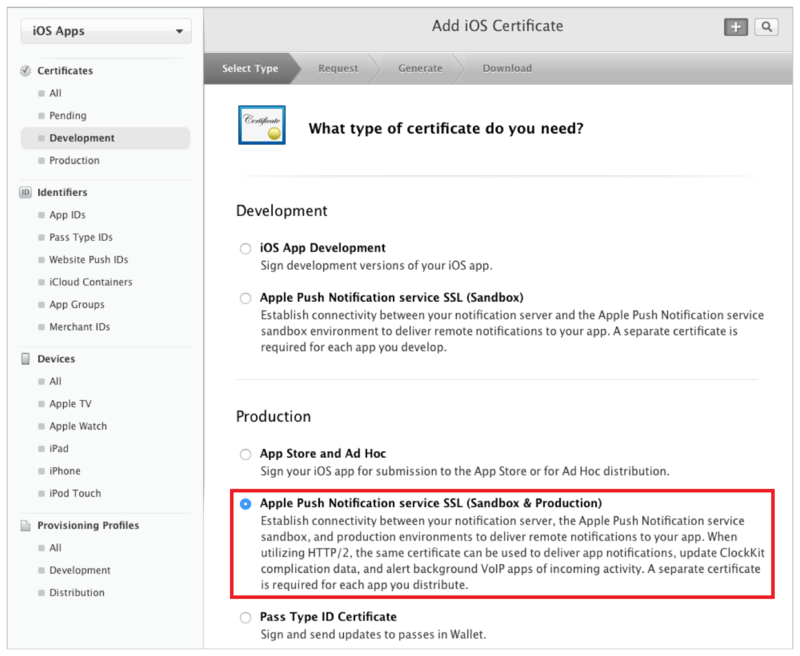 Important: Only a team agent or admin can generate Apple Push Notification service SSL certificates. Under Production, select the “Apple Push Notification service SSL (Sandbox & Production)” checkbox, and click Continue. 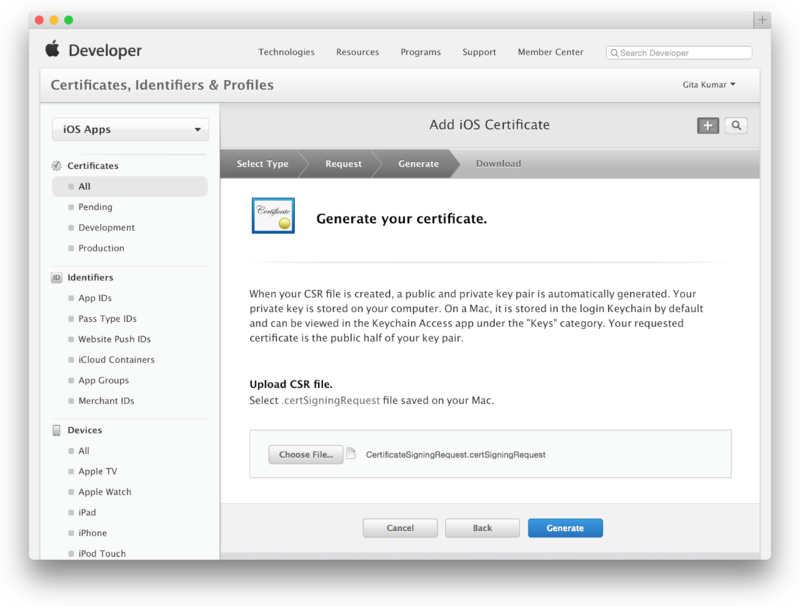 Follow the instructions on the next webpage to create a certificate request on your Mac, and click Continue. In the dialog that appears, select the certificate request file (with a .certSigningRequest extension), and click Choose. Convert Apple certificate file to the PEM-file. Start following command-line operation from bin catalog OpenSSL. 1. Open "Capabilities" tab in the XCode. Switch "Push Notifications" and "Background Modes" to ON. In "Background Modes" check "Remote notifications". * Note: This method is relevant only for iOS 10 and above. 3. Compile and run the app. You will need a device, because simulator does not support push notifications. Xcode will automatically choose new provisioning profile. If an error occurred during the launch make sure that there is a correct profile set in the Code Signing Identity. You'll be asked to confirm push-notifications. An app will request permission only once, if user confirm it - notifications will be accepted otherwise he wont get any push messages from your app. User can change it in device settings.